I didn't have a tart pan (I sold it at the end of summer as we were preparing for our move to FL that didn't happen)... so I used the next best thing, my springform pan. It worked perfectly despite not having the beautiful fluted edges. I used 2 fresh d'anjou pears and poached them with a cinnamon stick and a touch of vanilla paste for additional flavor... and I loved the little specks of vanilla that ended up baking right into the pears. I used ground almond meal for the almond cream. I found the almond meal at Trader Joe's and decided to give it a try. It worked beautifully and saved me time too! I used vanilla paste instead of vanilla extract in the almond cream too. If you haven't used vanilla paste before, you should give it a try! Although not quite a paste, it's more of a gel consistency and chock full of those vanilla bean flecks we all love. The Spice House carries it, as I'm sure other gourmet food stores do including Williams Sonoma, Sur La Table, etc. Looks great Joelen! I look forward to seeing your future TWD creations. What a beautiful tart! I have a new found love of pears and this tart looks just delicious! How fun that you joined TWD! I'm looking forward to seeing your entries. And those are some useful tips - I'll have to check Trader Joes for almond meal, and I wish I had added some cinnamon to the poaching liquid as well. 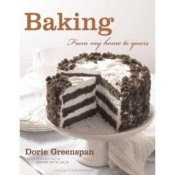 I like the suggestion of using a springform pan instead of a tart pan - I've successfully done that before too. That is gorgeous! I want to go home and make it right now!! Great job! We made a similar tart for a project in French class when I was in high school - I remember it was sooooo delicious. I just love the combination of the almond and the pear! Looks fantastic. I have never seen vanilla paste before I am going to have to buy some. What a great start to 2009 for the TWD'ers! Your tart looks great! Welcome to TWD! Looks great! Nice idea to poach some extra flavor into the pears. I can't believe I haven't bought this book yet. What have I been thinking?? It looks so pretty and I'm sure it tastes even better! I noticed the almond meal a couple months ago at TJ's and kept it in the back of my mind for the next time I make some almondy treats. Mmm. YUM, it looks great! You understood exactly how to cut the pears too! I got confused and winged it~ This tart was awesome and yours looks beautiful! Looks beautiful! I'm really eager to try this recipe after all the rave reviews. I'm definitely going to take your recommendation and sub the vanilla bean paste. Ooohhh vanilla bean paste! 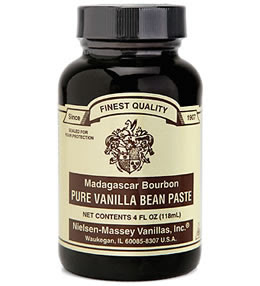 I am slightly obsessed with vanilla beans, vanilla paste etc etc. What a great idea! Love those specks. I totally have to try poaching the pears with cinnamon too. YUM! Welcome to TWD! I love that almond meal and even substitute for some of the all purpose flour in my baking. Wonderful tart. The pears are perfect. i'm so glad you decided to join TWD :) i hope you will enjoy the group as much as i have. you did a great job w/the tart, especially w/o the tart pan!